Ayala's vision for Arca South is for it to be a better version of BGC. Compare ALI's investments in Arca South, with the size of their revenues, and their balance sheet - It IS a substantial investment! Our established estates such as the Makati Central Business District, Bonifacio Global City, Cebu Park District, and Nuvali are market-leading developments in the country. These have become benchmarks in creating business and lifestyle centers and serve as blueprints for our emerging estates, such as Vertis North in Quezon City and Circuit Makati. In an effort to continue this legacy, we launched four new estates in 2014—Arca South in Taguig City, Alviera in Pampanga, Altaraza in Bulacan, and Atria Park District in Iloilo. The 74-hectare Arca South project in Taguig is envisioned as the next central business district to emerge South of Metro Manila. Apart from a mix of residential and commercial offerings, the estate will have offices, regional and transit-oriented malls, a 265-room Seda hotel, and a 250-bed QualiMed hospital. Arca South is highly accessible and will have direct links to the Metro Manila Skyway, and the modern Integrated Transport System (ITS) planned by the Department of Transportation and Communication. Ayala Land Premier (ALP) continues to lead in the luxury segment with the launch of its high-value residential condominiums and lots in 2014. ALP registered growth in revenues of 48 percent to P23.10 billion due to substantial booked sales generated by existing and newly-launched projects. These include residential lots in Soliento in Nuvali, The Courtyards in Imus/Dasmariñas, Cavite, Ayala Westgrove Heights in Silang, Cavite, and Ayala Greenfield Estates in Calamba, Laguna, as well as condominium units in East Gallery Place at BGC, Park Terraces in Makati, Two Roxas Triangle and Garden Towers in Makati and Arbor Lanes in Arca South. Alveo posted an increase in revenues of 14 percent to P10.38 billion as a result of strong demand for its residential and office developments. In 2014, Alveo strengthened its foothold in the upscale market with successful launches in key estates, such as Verve Residences Two and Park Triangle Corporate Plaza North Tower in BGC, High Park Tower One in Vertis North, Veranda in Arca South, Lumira in Nuvali, and Westborough Town Center in the Laguna-Cavite corridor. 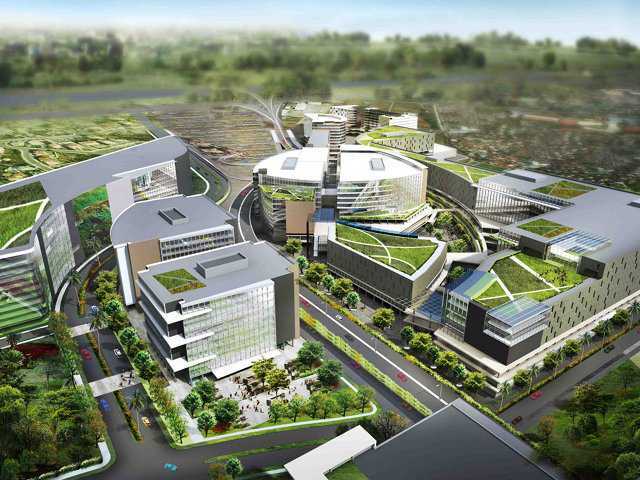 ...is envisioned as the next central business district to emerge South of Metro Manila. AVIDA- : 1,609 units : P115k : One Union Sq. 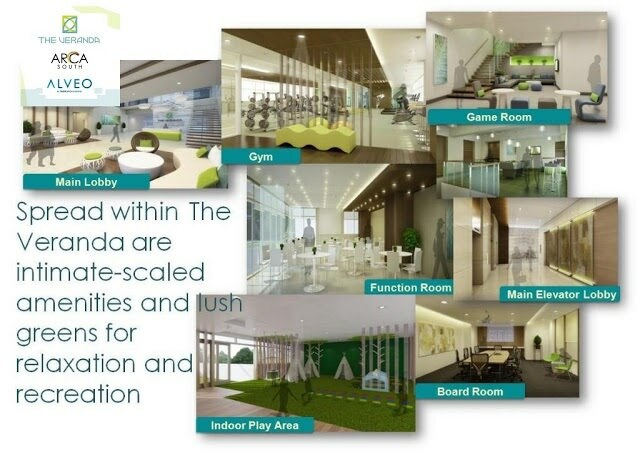 Ayala Land Premier (ALP): Arbor Lanes in Arca South. It's exclusivity is comparable to BGC's One Serendra, only better. This high end residential project will only have a cluster of 5 towers that are mid rise and low in density(8-10 units per floor) not to mention the 60% of the project dedicated to open space providing intimate garden living for homeowners. UNIT Type: Size : NO : Price with VAT : MeanPr / SQM : Per SM : Revs ? Unparalleled urban convenience within an emerging central business district. 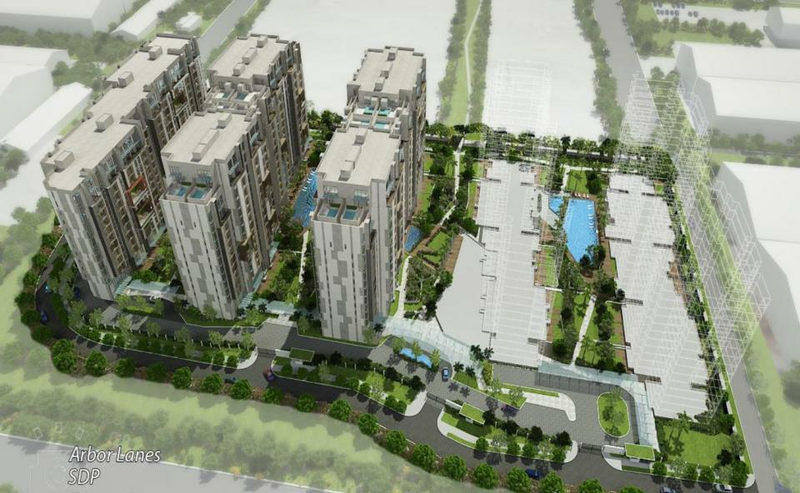 This new "lifestyle district" will provide innovative new ways of living. And the complex will be Alveo Land's prime community in Arca South. The Veranda is designed as a highly networked hub, ready for the future. The Veranda from Alveo Land is a four-tower residential condominium development located in a private and intimate portion of Arca South,. This mid-rise, low-density condominium will offer a less dense residential alternative to the densely-developed Metro Manila market. An atrium and a central landscaped garden bring natural light and ventilation throughout the development. Diverse lifestyle retail rows at the ground floor complete the picture of a one-of-a-kind residential condominium living that will be a quiet and refreshing retreat from the chaos of Manila's urban jungle. 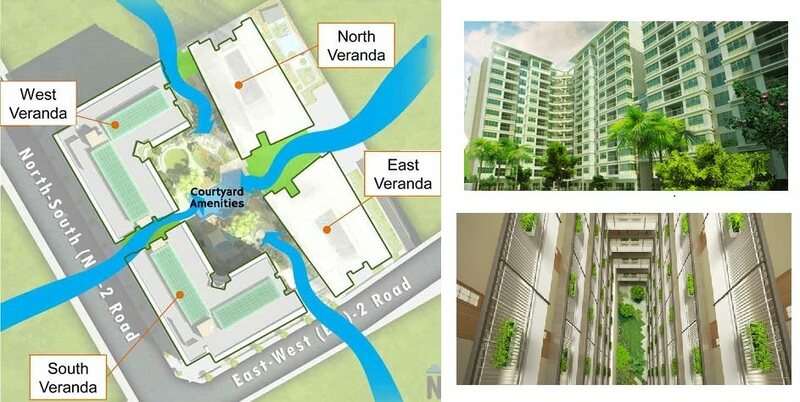 The Veranda at Arca South is a mixed-use residential condominium project in Taguig City, carrying the Alveo Land brand. The development promises to deliver an exclusive and distinctive living experience. A residential condominium neighborhood fully integrated within Arca South Taguig City, enhanced with retail, community areas and green spaces to create that vibrant streetlife experience that urbanites appreciate. The Veranda at Arca South offerings a mixed-use business and lifestyle hub that provide the perfect venues for today's individuals to foster relationships with their community and their surrounding environment. Playing host to various lifestyle hubs such as retail shops, leisure and recreation venues, business establishments, and open spaces for diverse interests, Alveo Land's brings to life a fine example of a rapidly growing dynamic and multi-functional that redefines the concept of modern urban developments. Property giant Ayala Land is planning to turn the former FTI complex into the country's next premier central business district (CBD). On Tuesday, ALI unveiled its plans for its master-planned project --Arca South. Meean Dy, ALI Vice President and Strategic Landbank Management Group Head, said the company has allocated P80 billion for the development of the first phase of Arca South. Arca South, located near the southern ends of EDSA and C5, and along South Luzon Expressway, is envisioned as the entrance to Metro Manila from those coming from the south. "Since 18 months since we won the property, we are on our way to realizing our goal of another premier central business district for the country," Dy said. In November 2012, ALI won the bidding for the 74 hectares of the FTI complex with its P24.3 billion bid. Dy said there are three factors that make Arca South ideal as a central business district: scale, location and access. At 74 hectares, she noted Arca South is the size of Makati CBD (92 hectares) and Bonifacio Global City center (39.7 hectares). 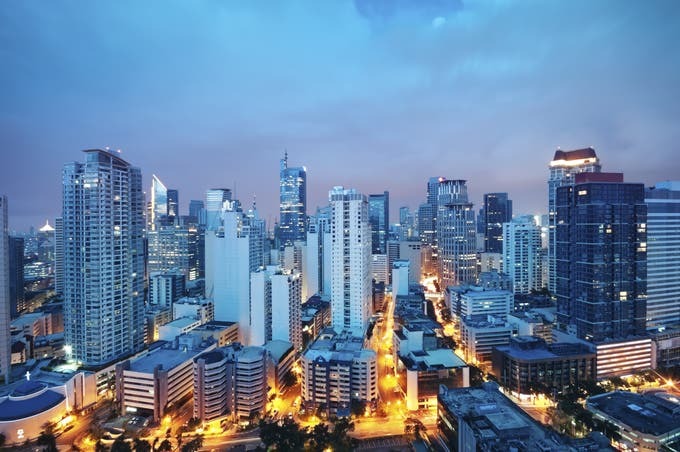 It is also strategically located, just about six kilometers from Makati CBD and BGC. Dy said Arca South is also capitalizing on two important government infrastructure projects - the Southeast Intermodal Transport System (ITS) project and the Skyway and C5/C6 connector road project. 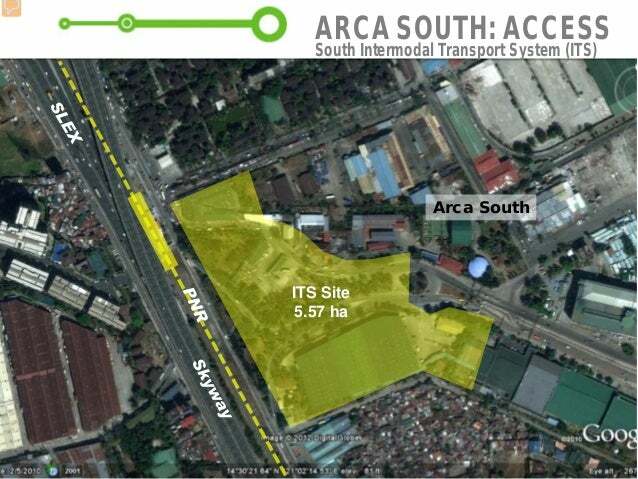 The Southeast ITS project will be located on a 5.5-hectare parcel reserved by the government, beside Arca South. DOTC is expected to bid out the ITS project within the year. It is expected to accommodate an estimated 4,000 buses and 200,000 commuters every day. 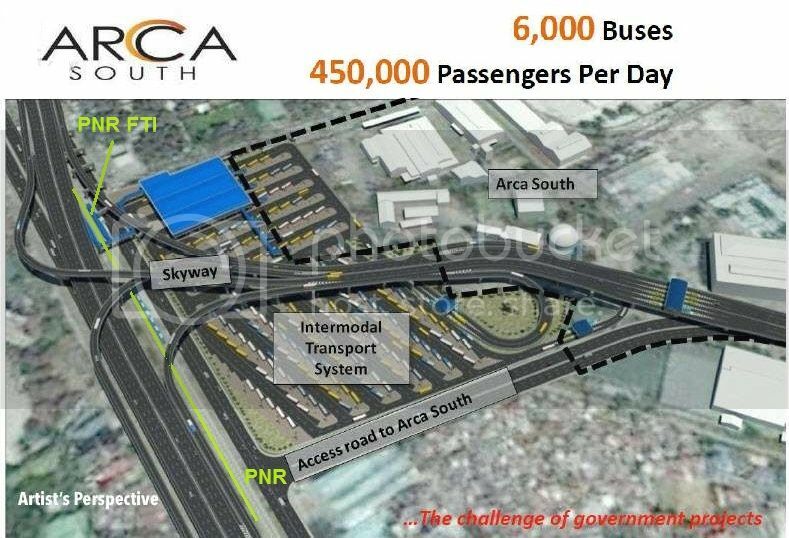 On the other hand, the Skyway and C5/C6 connector road project will include access ramps to Arca South as well as separate ramps going to the Southeast ITS. "As is typical for an Ayala Land development, the heart of the city will be a highly 'pedestrianized' center. In its full development, the 74 hectares of Arca South will have a built out area of 3.6 million square meters of gross floor area, roughly as large as the BGC you see today," Dy said. She that 40% of Arca South will be dedicated to open spaces. The development of Arca South will be done in phases. "For phase 1 alone, which is the first 5 years of the development, you can expect the following: ALI will invest a total of P80 billion in Arca South and launch 870,000 of gross floor area, with a roughly 50-50 split between residential and commercial use," Dy said. Ayala's residential brands - Ayala Land Premier, Alveo and Avida - will be launching projects that will offer 3,645 residential units in Arca South. 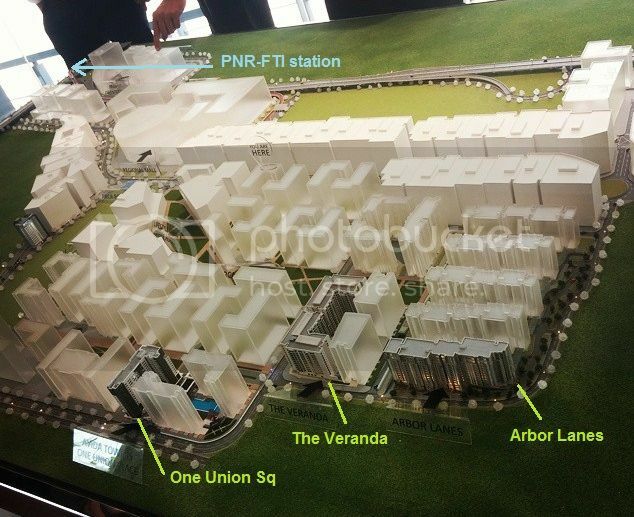 The first project to be launched is Ayala Land Premier's Arbor Lanes. There will also be three retail areas in Arca South - its own version of Bonifacio High Street, a transit-oriented mall to be linked to the Southeast ITS, and a regional mall with 150,000 sqm of leasable space. It will also have a 200-room Seda Hotel. Dy said ALI will also be launching 9 BPO buildings with a total 200,000 sqm of gross leasable area in the next five years. The first two buildings will be operational by 2017. It is accessible through two major arteries: the South Luzon Expressway (SLEX) and C-5 via SLEX's East Service Road. A terminal in itself, FTI is reachable through other means of transport as its vast confines is fronted by the Philippine National Railroad and the Laguna Bay at the rear. Also, its proximity translates to a 15-minute drive from the Central Business District in Makati and, a 20-minute ride from the Ninoy Aquino International Airport (NAIA) as well as the Manila Domestic Airport. The company's major activities in the 1970s include storage, food processing, research and quality control, marketing services, and trading. Its storage facilities included the Central Refrigerated Warehouse (CRW) with chilling rooms, freezer storage, ice plant, blast freezers and refrigerated processing rooms. FTI station is a station of the South Main Line of the Philippine National Railways. Like all PNR stations, this station is at grade. 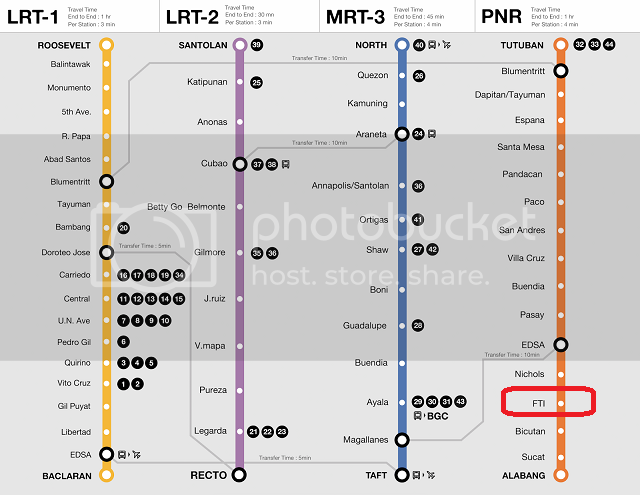 The station is near major landmarks such as the Ayala Land development Arca South, Technological University of the Philippines-Taguig Campus, the Sunshine Mall, the Taguig-Pateros District Hospital, a major warehouse of the National Food Authority and, most notably, a series of low-cost housing developments collectively called BLISS Taguig (commonly called "Tenement"). Avida Towers One Union Place in Avida’s very first offering in Arca South. Called: "the metro’s newest emerging growth center". Avida Towers One Union Place is a 9,872 sqm, modern-contemporary designed, three-tower residential condominium development in the southeast residential enclave of Arca South. Here, residents are assured of a lifestyle that is comfortable and serene as units and common areas are thoughtfully designed for everyone’s relaxed living experience. The green spaces and amenities are perfect venues for social convergence and playtime after a hard day’s work. As in all Ayala Land and Avida developments, residents are guaranteed of 24/7 security, and property maintenance by Ayala Property Management Corporation (APMC). The Philippines comprises over 7,000 islands and offers its residents endless beaches and crystal clear Pacific Ocean waters. The country has a warm year-round climate, a low cost of living, some of the best medical care in Southeast Asia and provides easy access to other destinations in Asia. Of course, as with any developing country, it is important to understand what specifically makes it a desirable retirement location for Americans. The following are the top six reasons why Americans retire in the Philippines. Up until recently, the country allowed internet service providers to set their own speeds, reducing the potential of a high-speed connection. In response to reform requests, the Filipino government has set a minimum speed requirement of 256 kilobits per second (kbps), giving signs that the country's internet speed will soon be on par with its other modern conveniences. Currently, however, it ranks at the bottom of Asian countries when it comes to connection speeds. For Americans looking to retire to this country, English is one of the Philippines' official languages. Many, if not all, Filipinos are fluent in English, making a transition to this country an easy one. Property giant Ayala Land Inc. (ALI), through subsidiary Ayala Land Hotels and Resorts Corporation, continues to bet heavily on the prospects of the Philippine tourism industry and now has 10 hotels under construction. Ayala Land will be redeveloping the current site of the Intercontinental Hotel in Makati into a mixed-use project with an intermodal tranport system. “We are in talks with them (Intercontinental) now on other opportunities,” said Legaspi. Ayala Hotels is planning to invest up to P30 billion over the next five years to put up a strong of Seda hotels across the country while looking at opportunities to expand the Seda brand overseas. Seda Nuvali’s landscaped lake provides a visual centerpiece within the Ayala Land-developed community in Santa Rosa, Laguna. One of the SEDA hotels will be in Arca South. "gateway to Metro Manila from the south"
MANILA, Philippines – Property giant Ayala Land Inc. emerged as the frontrunner for the P4-billion Integrated Transport System (ITS)-South Terminal project, beating the only other bidder, Filinvest Land Inc.
During the opening of financial bids yesterday, ALI offered a P277.89 million annual grantor payment (AGP) for the project, lower than FLI’s P1 billion bid. AGP refers to the payment to be made by the government to the concessionaire. When AGPs are made, the lowest bid wins subject to evaluation of the bid. “As far as we are concerned, the government of course, welcomes the lowest bid amount because that’s the amount that’s going to be paid by government for this particular service,” Jose Perpetuo Lotilla, chairman of the bids and awards committee and undersecretary for legal affairs at the Department of Transportation and Communications (DOTC) told reporters yesterday. Following evaluation, the DOTC would issue the notice of award for the project within a month. The ITS-South project involves the construction of a terminal within a 4.7-hectare area in the Food Terminal Inc. compound in Taguig City. The terminal is expected to connect passengers from Laguna or Batangas to other transport systems in inner Metro Manila. The project will also include the development of passenger terminal buildings, arrival and departure bays, public information systems, ticketing and baggage handling facilities, and park-ride facilities. In a disclosure to the Philippine Stock Exchange, ALI said the project is strategic to the company as it is right next to ARCA South, which it is developing into a mixed-use estate. 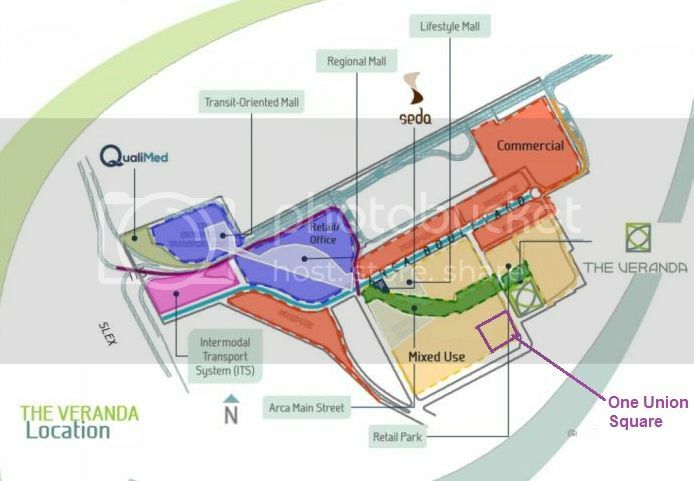 “ALI will be awarded by the DOTC with a 35-year concession agreement to build and operate the ITS-South project and will likewise have the right to develop and operate commercial leasing facilities on the same 5.57 hectare former Food Terminal Inc. property on which the future transport terminal will be built,” said ALI senior vice president and chief finance officer Jaime Ysmael. ARCA South, formerly known as the FTI complex, which the Ayala Group bought from the government in 2012, is envisioned as a central business district and gateway to Metro Manila from the south. This could help to bypass some of the worst traffic - but the Pasay Rd tp Greenbelt link would remain problematic, and is not a pleasant walk. An average rental growth rate of 1.5% was observed during 3Q 2015 for premium residential condominium property in the major CBDs. Rental rates for premium residential condos in the major CBDs continues to grow, increasing by around 1.5% in the the 3rd quarter. I have on my listing a property near Arca South. As the project gets developed, land and properties around it rises as well, and the property might just ride the increase in valuation. It's a newly-painted 12-unit apartment that is currently on full occupancy, mostly with employees from Makati and Taguig area. According to the owner, it earns at most P50,000. Google map attached to the bottom of the page. This newly-painted 12-unit apartment is currently on full occupancy, mostly with employees from Makati and Taguig area. It is conveniently located near the perimeters of Ayala Arca South. 2nd floor- 4 Studio type rooms w/ kitchen & CR each. Indeed, it seems to be very close, like 3-5 minutes walk from the area that will become ArcaSouth. 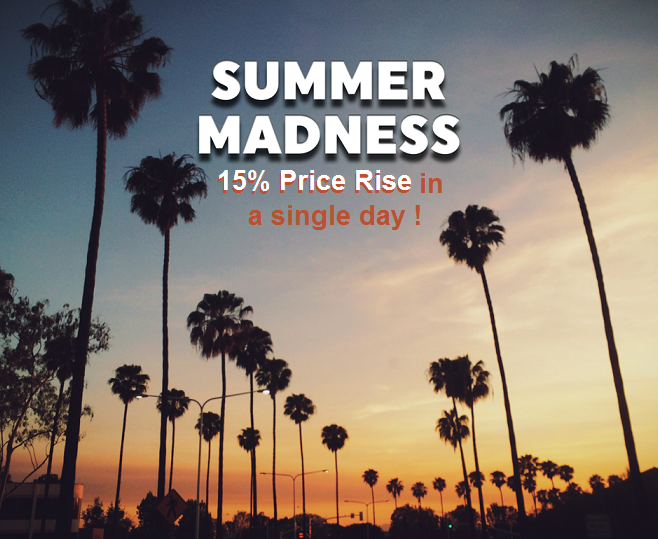 SUMMER MADNESS impacting prices at ARCA South? How to beat the price rises? 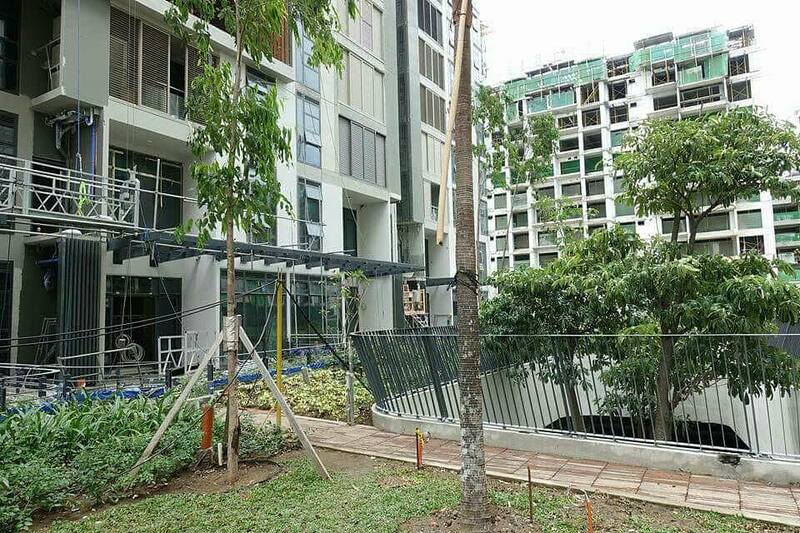 + Buying at nearby Veranda is one way - prices there seem slightly cheaper than the new Avida launch. I spoke for a few minutes today to an Alveo Premier agent within Greenbelt Mall. He was trying to sell me ALP's LANES project at Arco South. I asked him the price. He said about P180k psm. I was surprised, since i was recently shown Avida's project at Arca South priced "at about P190k per sqm. I said that it was very surprising to see Avida projects very near an ALP project being priced ABOVE ALP. He explained that "it was because of the cuts" - ie the ALP units are much larger. So ALP's one BR flat is 75 sqm, versus the 1 BR from Avida being less that half that size. So an ALP 1BR is about twice the price of an Avida 1-BR. When you look at it that way, the pricing probably makes more sense. But I really doubt that Ayalaland expected such relative pricing. The either over-estimated the demand for Lanes, or under-estimated the demand for Avida's projects. children whose families will live at Arca.) Nor do I see the offices that might have higher paying jobs, like those in BGC and Makati." He admitted that the lack of schools nearby could be a problem. I asked him where the children living in ALP units at Arca would go to school. He said, "Maybe BGC." How long does that take? I asked. "15 minutes," he answered. After I laughed, I said: Try doing that at rush hour. The DOTr yesterday led the groundbreaking of the over P5-billion ITX, a state partnership with Ayala Corp. meant to decongest traffic at EDSA and cater to all provincial buses plying the south of Luzon, Visayas and Mindandao destinations. The Taguig ITX is a 6-storey building on a 5.57-hectare property inside the FTI compound which would house a passenger concourse, a centralized ticketing area plus business and retail establishments. Construction starts by the 2nd half of 2018 and the terminal is scheduled to start operation by 1st half of 2020. It can accommodate 1,200 public utility buses and vehicles’ bays and parking. Once completed, it will house around 4,000 buses, with a capacity for 160,000 passengers daily. It will also feature a pedestrian walkway connection to the PNR FTI station and the proposed subway system. Transportation is a big problem in Manila. Although the city has a train system, it only goes to certain areas and routinely breaks down. Major roads are also almost always congested. If everything goes according to plan, the ITX will be able to take on about 4,000 provincial buses that currently pass EDSA and other major roads by 2020, the Philippine Daily Inquirer reported. The ITX will be built inside the 5.6-hectare FTI compound in Taguig and will be dedicated to buses going to and coming from South Luzon, the Bicol region, and the islands of Visayas and Mindanao. Once the ITX is built, buses from those areas will no longer enter EDSA ave and will park in the terminal instead. VERANDA : Living in The Flow with internal Courtyards - A type of Serenity? 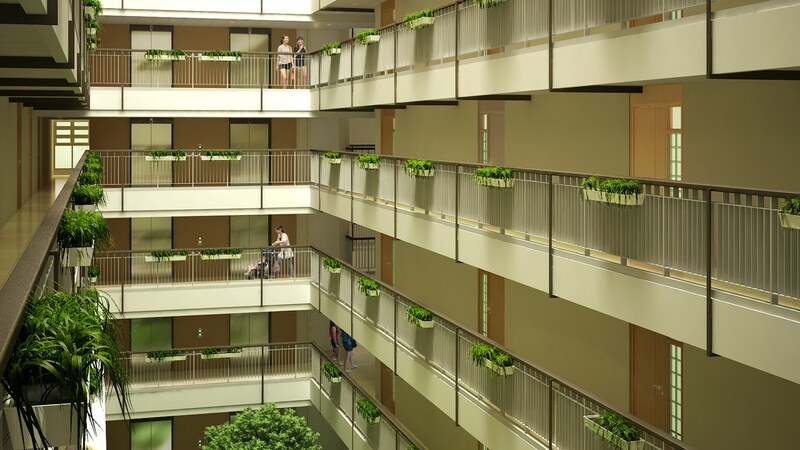 The Veranda spans 12,988 sq.m., with atrium gardens, open spaces and amenities covering 40% of the area. It will feature a so-called “Aeroflux” design to allow natural light and air throughout the property. Alveo Land is developing The Veranda within the 74-hectare master planned estate of parent Ayala Land in Taguig City. ALVEO LAND Corp. is accelerating its condominium development within the rising Arca South business and lifestyle district in Taguig City amid a strong uptake that could see the residential complex sold-out ahead of schedule. The subsidiary of Ayala Land, Inc. will launch the fourth and final tower of The Veranda next month or less than two years after introducing the project to the market, its Senior Division Manager for Project Development Antonio S. Sanchez III told reporters on Tuesday. North Veranda, a residential condominium, will rise 15 storeys high and offer 195 units, in addition to the 231 residences in West Veranda, 273 in South Veranda and 203 in East Veranda. “We’re ahead of schedule. Originally, the four towers of the Veranda was a four-year pipeline for us, but only after two years, we’re launching our last tower. So, possibly the four-year sellout period will be advanced to three years,” Mr. Sanchez said. Alveo Land has sold around 80% of the residential units in the first three towers. The development is particularly attractive for investors, with end-users only accounting for 43% of the sales thus far. “The first three towers, we were expecting it to be sold-out within three years [but] now we experience a faster take-up at around 25 to 30 units a month. For the fourth tower, I think it’s going to take another 12 months to sell out,” Mr. Sanchez said. Alveo Land expects to generate P1.9 billion in sales from North Verdana alone, reflecting an 8% increase in the property’s value to P140,000 per square meter (sq.m.) from P130,000/sq.m. when West Veranda and South Veranda launched in 2014. 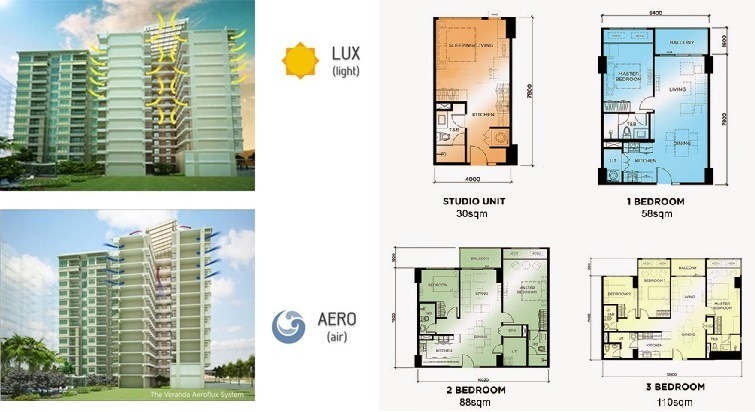 The company will offer studio-typed units (29-30 sq.m.) for P4.1 million to P4.6 million, one-bedroom (58-75 sq.m.) for P7.4 million to P10.5 million, two-bedroom (81-96 sq.m.) for P11.1 million to P13.6 million and three-bedroom (120-147 sq.m.) for P15.1 million to P21.9 million. Alveo Land will start turning over The Verdana in the fourth quarter of 2018, with the completion of West Veranda and South Veranda. It will deliver East Veranda next in the first quarter of 2019 and North Veranda in the fourth quarter of 2020. The company is investing P5 billion for the entire development, which is expected to rake in P8.2 billion in sales, Mr. Sanchez said.